The Hohokam people  desert farmers who occupied the heart of Arizona and the northern part of Mexico’s Sonora from early in the first millennium to nearly the middle of the second millennium  followed a cultural development similar to that of their Mogollon neighbors to the east. Like the Mogollon, the Hohokam left remnants of settled communities, fields and clay vessels to mark their emergence from their predominantly nomadic hunting and gathering traditions. During the first two thirds of their history, the Hohokam moved to the unhurried rhythms of their heritage, living in shallow pithouse lodges within villages which increased slowly in size and population over time. During the last third of their history, they marched to the quickening beat of a puzzling change, concentrating in pithouses and large surface structures within towns with populations of several hundred to more than a thousand. Like the Mogollon, they suffered unexplained cultural fragmentation and dislocation in the 15th century. In a broad sense, the Hohokam and Mogollon followed parallel cultural pathways, but each also left a cultural signature. While the Mogollon created a rich and distinctive legacy of images on stone and clay, the Hohokam produced extensive systems for irrigation, reached high levels of innovative craftsmanship, and responded dramatically to Mesoamerican influences. The Hohokam engineered and built "the largest prehistoric irrigation system in North America," according to John P. Andrews and Todd W. Bostwick in their book Desert Farmers at the River’s Edge: The Hohokam and Pueblo Grande." The Hohokam constructed labyrinthine canal systems to irrigate their fields and serve their villages along the banks of flowing rivers. They even devised specially designed structures and techniques for sustaining crops and communities on desert "outwash slopes," or alluvial fans, far from springs or permanently flowing water. In developing what ScienceDaily Magazine (February 2, 2001) called "by far the most advanced [prehistoric] canal irrigation system in the New World," the Hohokam used partial dams, or weirs, made of log and brush to divert water from permanently flowing rivers into their main irrigation channels. They used log-and-brush headgates to throttle and direct the flow of water within the main channels. They used networks of distribution ditches and, finally, laterals to conduct water to their fields and, sometimes, to village cisterns or reservoirs. Hohokam engineers regulated water flow velocities (and erosion and silting) by aligning the canals  apparently using rudimentary surveying devices  with gentle but consistent downhill grades of perhaps one to five feet in a mile. (Validating the work of their prehistoric predecessors, modern engineers, using sophisticated surveying instruments, frequently found themselves following the ancient Hohokam routes while building the canal networks of today’s Phoenix and Tucson.) 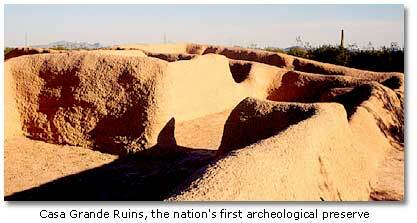 The Hohokam regulated water levels by matching canal widths and depths to flow volumes. In some areas, they reduced water losses by excavating deep, narrow channels to reduce surface exposure and evaporation under the sun’s heat and by plastering canal bottoms to minimize absorption by loose soils. They knew the value of water in the desert. In backbreaking labor, Hohokam workmen used digging sticks, stone hoes, stone axes and wicker baskets to excavate the canals. The workmen used the excavated soils to build embankments along the canal sides. In some locations  for example, at Pueblo Grande, near Phoenix  they built main canals which spanned 30 feet in width and reached 10 feet in depth, with 10-foot high embankments, according to Andrews and Bostwick. At other locations, they built canals of more than 50 feet in width. They extended some canals for 20 miles or more in length. Through the centuries, the Hohokam constructed, operated, maintained, abandoned and reconstructed networks of hundreds of miles of interconnecting canals to serve neighboring fields and villages. 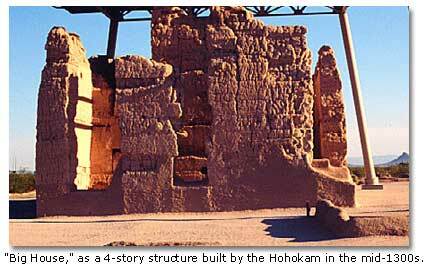 Through time, Hohokam farmers irrigated many hundreds of square miles of desert river valley land. At the Pueblo Grande site alone, they irrigated nearly 16 square miles, according to Andrews and Bostwick. By the end of the first millennium, the farmers were producing a veritable shopping list of domesticated crops, some of Mexican origin, some from native Sonoran Desert plants. According to Linda Cordell in Archaeology of the Southwest, Second Edition, the imported crops included corn (probably three types), beans (some half-dozen types), squash (at least two types), bottle gourds and cotton. Native semi-domesticated plant crops included amaranth (edible leaves and seeds), devil’s claw (basket fibers), tepary beans (edible seeds), panic grass (edible seeds), barley (edible seeds), Mexican crucillo (edible fruits) and tobacco. Some Hohokam communities cultivated large fields of native agave, which yielded both edible roots and basket fibers. The engineering and magnitude of the canal systems in river valleys, especially in the villages and fields within the tradition’s core area near Phoenix, speak to Hohokam technical abilities, labor investments and social organization. The water control installations and techniques at sites in the desert hinterlands, where there were no springs nor permanent streams, point to their resourcefulness. The Hohokam who lived in the desert, away from the flowing rivers, built villages and planted crops on alluvial fans, where they could capitalize on the rich soils and the runoff from mountain drainages, according to Cordell. Adapting not only to the environment of the desert but also to the conditions and land contours of a specific location, community residents excavated reservoirs to trap runoff water, and they built complex systems of brush diversion dams, earthen embankments, terraces and ditches to direct the flow both for replenishing catchments and for flooding their fields. At some locations, they dug wells at the bottom of drainages to tap shallow ground water. They grew yucca within rock mounds, which minimized water losses. The "Desert Hohokam," regarded as the poor cousins of the "Riverine Hohokam" by some archaeologists, sustained their villages for centuries without permanent water sources, producing virtually the same crops which their cultural brethren grew in the river valleys. Their agricultural skills notwithstanding, the Hohokam farmers never abandoned their hunting and gathering traditions, which yielded supplementary food for the prehistoric table. With the potential for crop failure in the desert always a concern, they continued to hunt the antelope, jackrabbits and cottontails of the desert basins and the bighorn sheep and mule deer of the mountain slopes. They continued to harvest the edible and useful plants of the valley and upland environments. If their agriculture gives a measure of Hohokam technical abilities, social organization and resourcefulness, their crafts offer an insight into their creativity and artistry. For instance, it was apparently the Hohokam artisans who invented the method for using the acidic liquid from fermented fruit of the saguaro cactus to etch exquisite designs, often precise outlines of horned lizards (or horned toads), on marine shells. Using dozens of species of shells, most from the Pacific Coast but some from the Gulf of Mexico, they created a unique genre of art in the deserts of western North America. Simultaneously, the Hohokam raised new standards in the crafting of jewelry, ornaments and mosaics from shell and exotic minerals; vessels and effigies from stone; vessels and figurines from clay; and paintings on ceramic surfaces. While the Mogollon people reflected their connection with Mesoamerica primarily through images on stone and clay, the Hohokam manifested their contacts most strikingly in their platform mounds and ballcourts. The Hohokam platform mounds  typically three- to 10-foot high rectangular earthen structures with plastered flat tops and sloping sides, measuring several hundred to several thousand square feet in area  had ancient roots, although the purposes of these massive structures have never been fully understood. Mesoamerican communities began building mounds, often with earthen cores and cobblestone facing, some 3000 years ago, signaling a growing social complexity and integration. Presumably, they used the structures, which often dominated a community plaza, as a kind of Nob Hill for religious, political or military elite residences; or as a commanding stage for temples, rituals, dance and ceremonies; or as funereal monuments for community or religious leaders. The Mesoamerican sphere of influence, some have suggested, may have reached eastern American tribes, who constructed thousands of mounds in the Mississippi and Ohio River valleys. It clearly touched the Hohokam. noting that most Hohokam did not live on platform mounds or even in compounds, suggests that the residential use of platform mounds represents a ‘consolidation of power on the part of local elites.’"
Archaeologists, however, hold contrasting views of the function of the mounds. In a meeting of the Arizona Archaeological and Historical Society on February 16, 1998, archaeologist Todd Bostwick (co-author of Desert Farmers at the River’s Edge: The Hohokam and Pueblo Grande) said, "Dissatisfied with the common view that Classic period [1100 to 1450] platform mounds were secular homes for the Hohokam elite [as suggested in Cordell’s book], I presented, in 1992, an alternative interpretation that focused on the possible symbolic and ceremonial functions of platform mounds. Based on ethnographic and archaeological data, I proposed that these structures may have served as a locale for rain-making cults involving priests who were responsible for weather control and other ceremonial activities. I also suggested that a human burial on top of one of the Las Colinas [near Phoenix] platform mounds was a shaman." Archaeologists have a lot of work ahead of them before they fully understand the purpose of the Hohokam platform mounds. They face similar problems in interpreting the Hohokam ballcourts, excavated oval-shaped structures twice as large as a basketball court and even more ancient in origin than the platform mounds. In fact, Mesoamerican peoples were constructing large ballcourts three and one half millennia ago, at the very dawn of their civilization. Court size and architectural detail varied with time, cultural affiliation and geographic location. Commonly, however, the Mesoamericans laid the playing field out in the shape of the letter "I." The longest dimension, or "alley," which connected the cap and foot of the "I," might measure 80 or 90 yards in length and five or six yards in width, although the great ballcourt at Chichen Itza, on the Yucatan Peninsula, was several times larger. A ballcourt alley was usually bordered by vertical or sloping walls with stone facing. Apparently, the nature and rules of the game, called tlachco, also varied with time, cultural affiliation and geographic location. At Chichen Itza and other sites, the sport appears to have resembled a cross between soccer, basketball and hockey. The competitors, who wore feathered or plain helmets and cotton cloth body padding, probably used their hips, shoulders, knees or heads  but not their hands  to try to knock a four- to five-inch diameter rubber ball through a stone hoop, which was mounted perpendicular to the earth at mid-court in the vertical stone walls. Team members likely blocked and checked their opponents in trying to mount a scoring drive or defend their own hoop. Games often went on for days, ending only when a team finally drove a ball through a hoop. Spanish colonists, who were not squeamish people, felt shocked by the brutal play in tlachco. To the Mesoamericans, tlachco transcended entertainment. It unified and bonded their community. They regarded it as a spawning ground for heroism, a showcase for their elites, an arena for dispute resolution, a call to high-stakes wagering, a ceremony for religious expression, a metaphor for celestial processions, a link with their deities, a re-enactment of the mythological struggle between good and evil. In their latter centuries, the Mesoamericans elevated tlachco to the level of sacrificial ritual, possibly beheading the winners (rather than the losers) of the game because the heroes were deemed worthy of the "honor." The Mesoamericans celebrated tlachco in community and spirit; they memorialized the game in bas relief, murals and figurines; and they evidently exported the basic concept of ballcourts and sacred games northward to the Hohokam. The Hohokam, however, reshaped the architecture of the ballcourts and nature and rule of the sport to fit their own religious and social agenda. So much so, in fact, that some archaeologists have called the basic interpretation of the excavated Hohokam ball courts into question. They have suggested that the arenas might have served not as sites for games, but rather, as theaters for ceremony and dance. Other archaeologists, however, point to rubber and stone balls at some sites; Mesoamerican-style figurines of probable padded athletes; rock art images of possible players; and stone markers in major ballcourts as strong indications if not absolute proof that the Hohokam played their version of tlachco. The Hohokam built more than 250 ballcourts at more than 150 of their larger communities in Arizona between about 750 and 1250. The ballcourts, say Andrews and Bostwick in an excellent description, "are oval, bowl-shaped depressions that vary in size but average 80 to 115 feet?in length and 50 feet?in width. Berms of earth, up to 9 feet?high, encircled the depression and were constructed using the excavated dirt. During a Hohokam ball game, dozens and perhaps hundreds of people could watch from the embankments surrounding the ball court. The largest Hohokam ballcourt, excavated in the mid-1930s at Snaketown, 20 miles?south of Pueblo Grande [in Phoenix], was large enough for 500 people to line its banks. "The playing surface of the ballcourts was smoothed and plastered with caliche, producing a symmetrical, concave floor surface that sloped slightly up toward the edges and then rose steeply onto the embankments. At each end of the ballcourt, constricted openings were constructed which may have been goals into which players attempted to place rubber or stone balls. In the northwestern ballcourt at Pueblo Grande, stone markers were embedded in the floor in front of these possible goals, as well as in the middle of the court, possibly denoting zones of play." While the Hohokam evidently put their own unique stamp on their ballcourts and the sport itself, they also adapted the games to their own ends, possibly using them to unify their communities, promote the marketing of goods, encourage trade with other peoples, and provide forums for ceremonial exchanges. They seemed to have little inclination toward ritual sacrifice of winners or losers, probably to the relief of the athletes. In about the 13th century, the Hohokam ceased building ballcourts and playing the ancient game, perhaps signaling a waning contact with Mesoamerica and the approaching end of the Hohokam time in the desert.